The Center For Research Libraries (CRL) holds an extensive collection of CCC camp newspapers. Access to these digital and micro-form collections can be made through a CRL member library, with the New York Public Library (NYPL), for me, being the one most convenient. 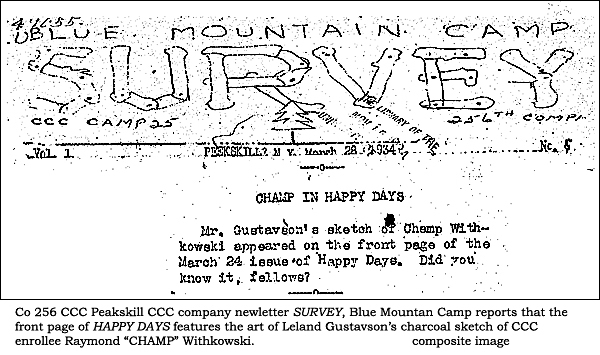 It was while scanning through the March 28, 1934 edition of the SURVEY from Company #256 Blue Mountain Camp in Peekskill, New York that this accidental discovery of identity was made. A small, easy to miss blurb, “CHAMP IN HAPPY DAYS”, took on more meaning with the mention of “Mr. Gustavson”. This simple sentence provided the definitive clue as to the identity of (Raymond) “CHAMP” Withkowsky, as the CCC boy in this CCC art – this find was a stroke of luck. 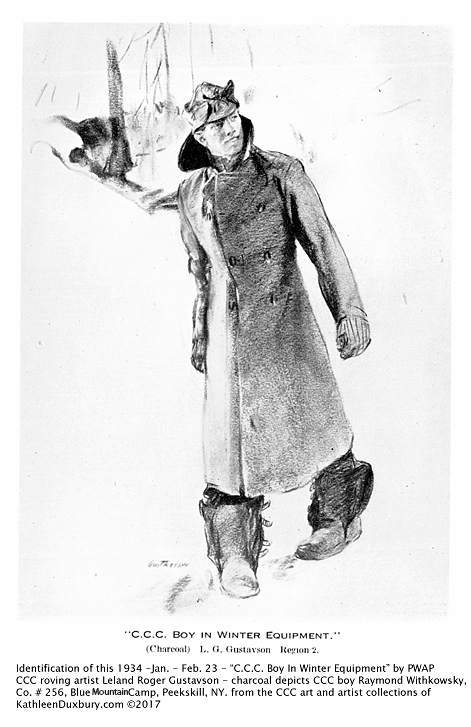 Gustavson’s charcoal drawing of CCC boy Withkowski was included in the 1934Corcoran Gallery of Art PWAP art exhibit in Washington, D.C.
“Champ” Withkowsky is mentioned numerous time in editions of the SURVEY. He was a star player for the camps baseball team and “Champ” seemed to have a place of respect within the camp hierarchy of positions – a mention is made of his love for pork chops and the work he does in the kitchen. 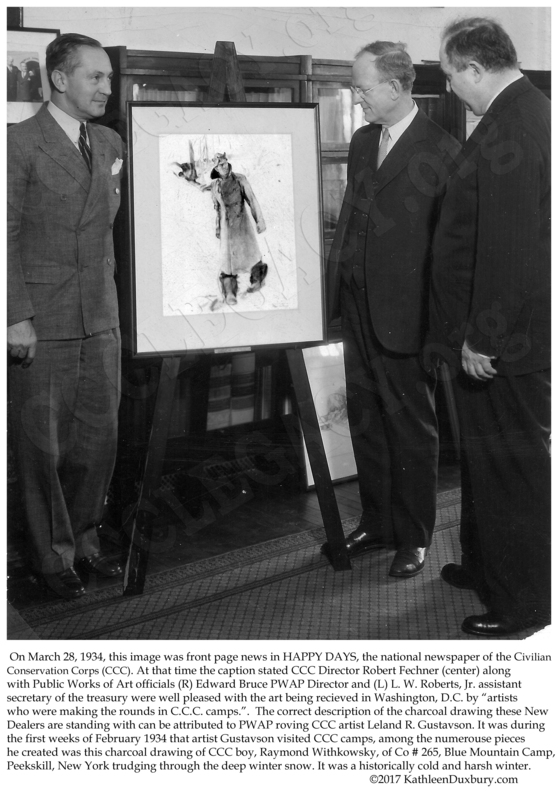 At some point, the framed print, was allocated to the office of Robert Fechner, Director of the CCC. 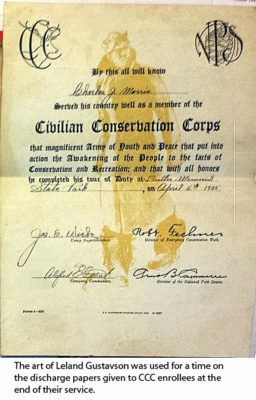 For a time the drawing was used as background art on CCC certificates of discharge given at the end of tours. Which leads to the question, another mystery – When Raymond “Champ” Withkowsky returned to Troy, New York after his June 1934 discharge he would have been given a certificate for his tour of service with the Civilian Conservation Corps . . .
Did his certificate feature the background art of Leland R. Gustavson C.C.C. Boy in Winter Equipment, a memorable image of himself? Your website is truly fascinating and a great work of art.